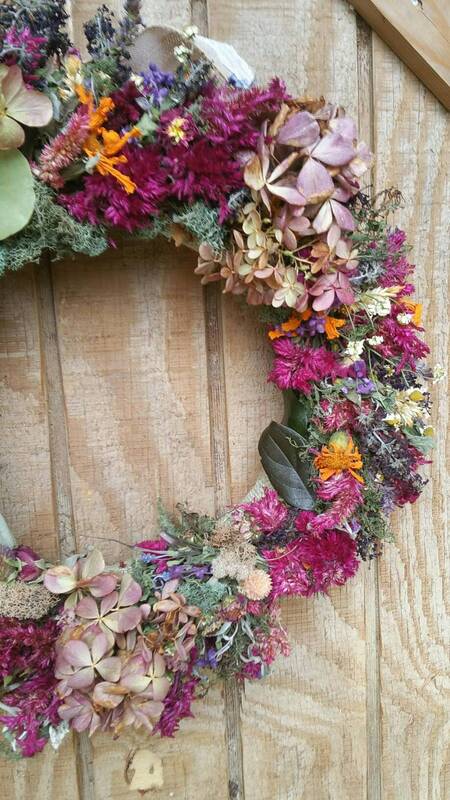 Pictured is a dried floral and herb wreath 'twill make a Wonderful addition to your well decorated and cozy home! Base is wrapped of burlap. Your choice of with or without ribbon. If you get a ribbon, it will be neutral in color unless you specify a different color. These wreaths are made to order and are not an exact duplicate of the pictures, but are made with similar colors/herbs/flowers and what I have on hand. If you'd like to see certain items, themes or colors incorporated into your wreath, just let me know. Measures approximately 14 inches diameter. Keep in mind this is a dried item, and fragile in nature. There will be a degree of shedding and it doesn't tolerate a bunch of fiddling with. It is recommended to keep it in a place of no extreme temperatures, not a lot of sunlight, not a lot of heat, and doesn't like moisture or humidity. Krylon Matte is a good product to spray on it for extra protection.